If you’re like most business owners, you might find it easy enough to write a blog post and publish it. But publishing a blog is the easy part. Making sure it gets eyeballs is a whole other problem. But never fear, I’ve got some super simple yet effective tips on getting more readers to your blog coming right up. Here are 10 things you need to check before you publish your next blog. There’s no point writing a blog without a keyword phrase in mind. You want your blog to be found on Google and the only way you can do that is to optimise your blog for a specific keyword phrase. Make sure your blog title has your keyword phrase in it, try and get it into the first paragraph, and make sure it’s in your content at least a couple of times. Don’t get too hung up on the green light in Yoast, but it can be a good indicator of what’s working and what you could potentially improve. Don’t write a vague heading that will leave people guessing as to what the post is actually about. And while writing an eye-catching heading is a must, it’s best to avoid click-bait headlines, especially ones that don’t actually give the reader what they expect to find. People these days are time poor. They don’t have oodles of spare time to read every word on every blog post. If they come to your blog and see massive long paragraphs of text, chances are they’ll be immediately turned off. Keep your paragraphs short and scannable for easy reading. Speaking of scannable, don’t forget to include sub-headings in your blog post. These break your content up into manageable chunks for readers to digest easily. Don’t forget to format them as headings too (super easy to do in WordPress) for added SEO benefit. You might think once your blog is written, the writing is done. Wrong! Your blog needs a great title tag and meta description too. These are the first things people will see in the Google search results and will influence whether they decide to click through to your website or not. Include your keywords in them but make it appealing to potential readers. Adding internal links to your blog post helps in a number of ways. Firstly, it helps to keep readers on your site for longer as you’re giving them the chance to read more of your content. Secondly, it helps Google to understand your site structure and how your content fits together. External links are also good for your blogs. You’re giving your reader more information that’s relevant to them and helps your blog to be seen as authoritative. 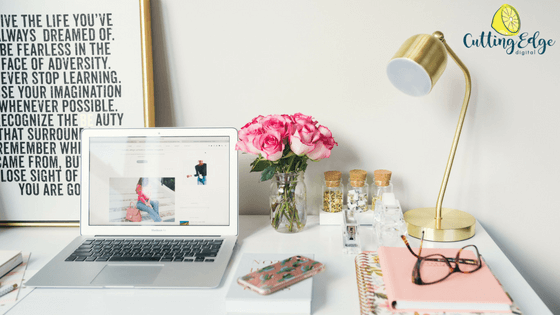 It can also help your blog get seen by the websites you’re linking to – when they notice you’re sending them traffic, it gives them the opportunity to reach out to you and potentially build a new relationship. Adding images to your blog helps to break up big blocks of text and make your blog more visually appealing. Always use relevant images and ones of good quality – no-one likes a crappy image and it can detract from the content of your blog as well. My go to stock image websites are Pexels and Unsplash. I then use Canva to resize them into images that will fit nicely on my post. Don’t forget to keep your image sizes small – TinyPNG is a great tool for reducing file size. ALWAYS proofread your content. It’s always a good idea to wait 24 hours between writing and publishing. Often you’ll come back to your post with fresh eyes, and pick up any spelling or grammatical errors, or rewrite some sections to sound better. Grammarly is a fab online tool that picks up spelling and grammar errors – get the free Grammarly plugin here. Every blog needs a call to action (CTA). People need to be told what to do when they come to the end of a post. Want them to comment? Ask them to leave one. Want them to contact you? Tell them how. Want them to subscribe? Have a subscribe box ready and waiting. Remember that every person that reads your blog could be at a different stage of their customer journey. Make sure your CTA matches where they are at in their journey. When you write your blog title in WordPress, your URL will automatically be generated from that. It’s a good idea to check the URL before you hit publish so that it’s not too long and doesn’t contain unnecessary stop words like the, in, of, etc. Also, if you’re writing a list post, you might be tempted to include the number that’s in the title in your URL. But if you might go back later and either add or remove points, it’s better to not include the number in the URL in case it changes after you amend it. You don’t want readers clicking through expecting to see 50 things, and only seeing 30 because you’ve removed some points. And there you have it – 10 things you need to check before you publish your next blog! I hope you’ve found this helpful and it can improve not only your blogging but your SEO too. If all this sounds like far too much effort for you, why not get me to write your blogs for you? I love writing blogs for other businesses and websites. Find out more about my blog writing services and get in touch with me for a no-obligation chat today!